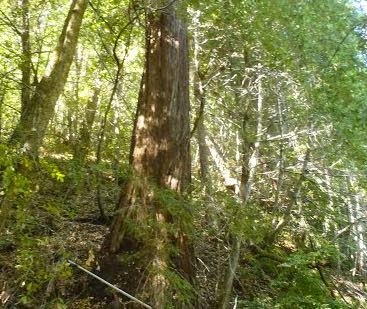 THPBlog: Mendocino Redwood Company to log on steep and unstable slopes NW of Ukiah, CA. Mendocino Redwood Company to log on steep and unstable slopes NW of Ukiah, CA. This THP is about 5 mi NW of Ukiah, CA and Highway 101 at an elevation of 1,200 to 2,489 feet. Mendocino Redwood Company is planning a tractor and cable logging operation on steep and unstable slopes in a Douglas fir forest. The THP area flows into the Russian River which is listed as impaired for sediment and contains chinook salmon, coho salmon and steelhead. There are 18 landslide terrain sites including debris slides, cut bank failures, fill failures, disrupted ground, rockslides, earthflows and steep streamside slopes. Mendocino Redwood Company is planning to use tractors on unstable slopes on existing skid trails, and to use tractors on steep slopes up to 65% grade within units designated for cable logging. They also want to construct 2 segments of road near a spring area, and construct 100 feet of road across an unstable area to avoid rare plants, and construct 100 feet of road across the toe of an older unstable area. 38 road drainage sites are planned for work including rocking, dip construction, culvert repair/replacement and re-construction of washed out crossings. White flowered rein orchid was found along the cut bank of an existing seasonal road, and north coast semaphore grass was found at 3 locations inside and adjacent to unit 2, and an existing seasonal road. For spotted owl territory MEN0446; this THP will remove 42 acres of foraging habitat within .7 mi, and for spotted owl territory MEN0566; this THP will remove 3 acres of foraging habitat within .7 mi. More information is available on the THP Tracking Center website.